Concrete Melody, A consistent amalgamation of extravagance, solace, and style mix to give away really modern outlook towards life. These Residential Apartments in Hyderabad are wonderfully crafted bearing in mind all your needs. Concrete Melody in Chanda Nagar is constructed by Concrete Constructions, a customer friendly construction firm that always focuses towards delivering the best to its customers. Concrete Constructions has gained the name and fame in constructing marvelous Apartments in Hyderabad with the use of high-class building material that enhances the looks of the property along with increasing its life span. Concrete Melody offers 2 BHK and 3 BHK Apartments at one of the prime locality in Hyderabad. With proper ventilation and uncluttered wide space, Concrete Melody makes you feel blissful right from the moment you enter in your beautiful Apartments at Chanda Nagar. 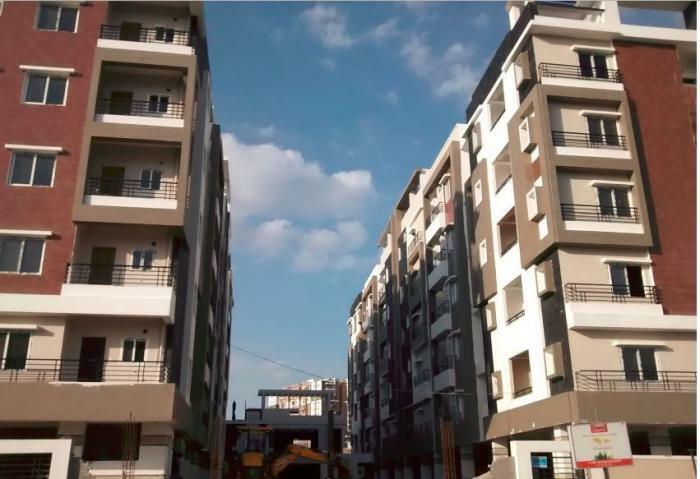 Concrete Melody is one such property in Chanda Nagar, Hyderabad where luxury comes with affordability and the inhabitants enjoy the perks of living in one of the best localities of town. The Apartments in Concrete Melody are deliberately constructed so as to provide easy access and transportation to other parts of the city by wide roads. The amenities in Concrete Melody will definitely make your life pleasant. Some of the amenities installed within this property are Landscaped Garden, Indoor Games, Swimming Pool, Gymnasium, Play Area, Intercom, Rain Water Harvesting, Club House, Badminton Court, Maintenance Staff, Multi-purpose Hall and Security. Location Advantage: Concrete Melody is strategically located at Chanda Nagar to give unmatched availability from all the vital areas and places of basic utilities such as hospitals,schools,supermarts, parks,recreational centers and so on. Established by A.Anil Kumar reddy and T. Praveen kumar Reddy in 2002, concrete constructions in one of the reputed developers in twin cities. In just 10 years, the firm has delivered more than 20 projects, and has to credit over 7,00,000 square feet of constructed area, over hundereds of satisfied residents and over 6,00,000 square feet under various stages of construction. The beautiful landmarks that carry the Concrete stamp of class are the culmination of a struggle that began many years ago in humble surroundings. Concrete Constructions nurture a vision to create wonderful buildings for people to live in and appreciate. The numerous residential and commercial buildings in and around Hyderabad, are testimony to the fact that there is a construction firm with a heart of gold, an architect with a vision and a determination to excel. Concrete Constructions. is a professional firm run by dynamic professionals with ample experience in construction, particularly in maintaining high quality standards. It is indeed a pleasure to the eyes to see the highest aesthetics and smart touches prevailing in every aspect of a Concrete building. These are the advantages that make Concrete Constructions the reputed builders in Hyderabad. The past is the biggest indicator of our future. Our satisfied customers are our biggest references, even as our ongoing projects get booked very quickly after we announce them. Concrete Constructions are grateful to their customers who have encouraged us to attempt bigger and more ambitious projects. We are confident that our determination to provide the highest quality standards in each and every one of our projects will provide the momentum to excellence. CONCRETE CONSTRUCTION is an GOOD builder. It has 7 on-going projects with total inventory value of Rs.100 Cr and 6 completed Projects. Location of this project offers decent life style and has access to Schools, Super Markets. But does not have access to Cafes, Star Hotels. etc. It has access to Workplaces like Spark Infosys and Parks like Sai Dhamam Gardens and Super Markets like More-Trinetra Super Retail Limited and Schools like Genesis International School and Malls like City capital mall This location is recommended for people who have 24x7 help for daily needs. 4 No.s of Six-passenger lifts with V3F Kone/ Johnson make. Lift, Sound Proof Generator, Transformer, 3 Phase power connection, Panel board, Intercom, Manjeera water, Drainage, Children's play area with equipments, MPH, Gym room with equipments, Baby's swimming pool, betterment and development charges. Ask from 15 other people who enquired about Concrete Melody. Review of Concrete Melody, Chanda Nagar? Its price, location, builder etc. Review of Concrete Construction, Chanda Nagar? construction quality, trustworthy, delivery history etc.? Review of Concrete Melody, Chanda Nagar location? neighbourhood, connectivity, schools etc.? Comparison of Concrete Melody, Chanda Nagar to nearby projects? Is it rightly priced? What is your feedback on this Concrete Melody, Chanda Nagar? Depends on brand name and complete the project in time etc? Will this be a better option for investment or to live in Concrete Melody, Chanda Nagar? Can you give some suggestion? Is the Concrete Melody, Chanda Nagar has more potential in terms of capital appreciation, ROI, Rentals, Proximity to social infrastructure etc?